Present study compared the rheological properties of glutinous rice flour (GRF) gel (33.3%, w/v) added with raw bee honey (RBH) or stingless bee honey (SBH) with/without heating treatment. RBH (diatase activity: 12.14 Schade) and SBH (1.53 Schade) significantly reduced the network of GRF gel by lowering the gel viscosity, with RBH having the highest rate of viscosity decrease (− 2.74 × 10−5 Pa). As the addition of heated-SBH or heated-RBH did not reduce gel viscosity, it was hypothesised that active diastase played a major role to weaken gel network. This was further supported by the significant and the lowest storage modulus (G′) value of RBH–GRF gel (5.99 ± 0.02 Pa), as compared to SBH–GRF (6.27 ± 0.04 Pa) and control (6.33 ± 0.04 Pa). A detail of rheological behaviour of the gels was further explained using power law. 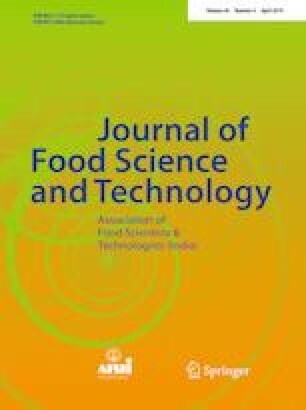 Overall, this GRF gel model has successfully demonstrated the potential of honey diastase in weakening network of starch-based food. This study was funded by Universiti Sains Malaysia Research University Grant (Grant No: 1001/PTEKIND/8011023). Seow acknowledges the MyBrain15 (MyPhD) scholarship awarded by the Ministry of Education Malaysia (Higher Education).